Photo: Students in The Shadow Project use audiobooks to access the material their peers are reading, part of Shadow’s comprehensive new model. Most children in special education in Oregon now spend at least 80 percent of their day in the general education classroom. That’s one reason why The Shadow Project is expanding to provide inclusive, full-day support for students with learning challenges, and outreach to their families. 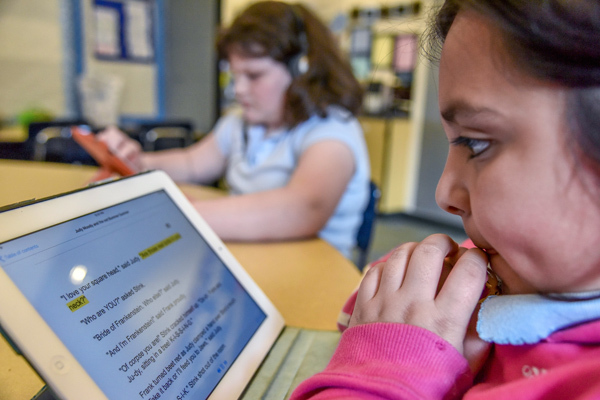 To that end, The Shadow Project is piloting new programming at six Portland schools, with SuperSensory Literacy Spaces containing audiobooks that give students access to the same reading materials as their peers. Over the next three years, Shadow will supplement its special education literacy center-based program with a more comprehensive, culturally responsive service model that brings together principals, special education and general education teachers, occupational therapists, parents, and community partners to support students with learning challenges. For example, Shadow will provide family workshops that teach parents how to access the audiobook library at home, so that children can confidently complete homework and read for fun. The Shadow Project currently serves 1,600 students in 35 predominantly Title I schools in Portland, East Multnomah County, and McMinnville.